This really was quite a difficult entry for me to place. Eventually I've settled for its inclusion within the Packaging section, primarily because it's made of cardboard, though, in reality, it is 'packaging for the home', rather than the more conventional usage. Simplistically this is a deeper version of the usual post-war set # 3 box, with not dissimilar style internal fittings, plus supports for the Trays. The box [above] includes a rectangular card section, without a bottom piece, which helps both partition the box and support the Trays. I hesitate to call this a Tray, though, with four deep sides and a base, that is effectively what it is. This also helps support the Trays. The Small Tray has seven sections, one of which is more than twice the size of the others. This Tray sits inside the box, to one side, on supports provided. The Large Tray has three rows, each of seven sections, one section again being a little larger than the others. Uniquely, this tray is fitted with cloth lifting tabs. This tray is designed to sit inside the box, resting on top of the internal partitions. The method of manufacture is essentially the same as that used for both the standard set boxes and the cardboard Retail Display Cabinets, producing a box which was strong enough to cope with careful, rather than vigorous, handling by the young BAYKO collector. Click here for more information on Retail Display Cabinets. Firstly, and the most obvious difference, is that the style [left] was manufactured with the standard 1950s set box label. The second style [right] clearly does not include this label. Secondly, there is a more subtle difference in the size of the tabs fitted to the Large internal Trays, as described above. The label-less version has broad, cloth tabs to lift out the Tray, whereas the labelled version has much thinner [less robust] cloth tabs. If you forced me to choose, I would suggest that the label-free, chunky cloth tab version was the later of the two, cost saving and weakness elimination, respectively, being the most likely driving factors. The purpose of the BAYKO Storage Box is self-explanatory, but, of course, individual BAYKO collections are different. As the letter [left] says, none of the sections are labelled [unlike the Retail Display Cabinets] leaving the young modeller free to plan his or her own storage strategy! BAYKO Storage Boxes can easily absorb a set #4 and more, making it aspirational rather that essential, though you can't really aspire to something you don't know about can you? I've been collecting BAYKO, on and off, for over sixty years, and, until relatively recently, I'd never heard of these Storage Boxes. Of course I've come across lots of wooden 'Dad boxes', parental carpentry projects for housing those treasured collections, and it's easy to conclude that most of these wouldn't have existed if the availability of 'official' BAYKO Storage Boxes had been more widely known! …a zero charge may help explain the marketeers acceptance of the 'debranding' of the label-free version. A real point of frustration is that the letter is undated, so we don't know exactly when it, and the Storage Box, were in use. We can pin the date down a little as the address is given as Gibraltar Row, where Plimpton lived between 1938 and 1955, though the Storage Box colour scheme is very much post-war. I can't see this sort of item existing in the post-war austerity years, so I suspect 1950 to 1955 to be the most likely dates. Thanks to Robin Throp for first bringing this to my attention and to Stan Curran who provided many of the images here. 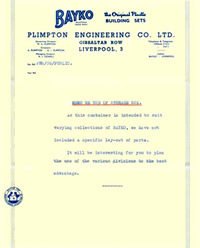 MEMO RE USE OF STORAGE BOX. As this container is intended for use with varying collections of Bayko, we have not included a specific layout of parts. For completeness, it has also been suggested, though with no concrete evidence, that these BAYKO Storage Boxes could have doubled as Salesmen's Sample Boxes. The [later?] label-free version, with no BAYKO branding, perhaps gives the lie to this.